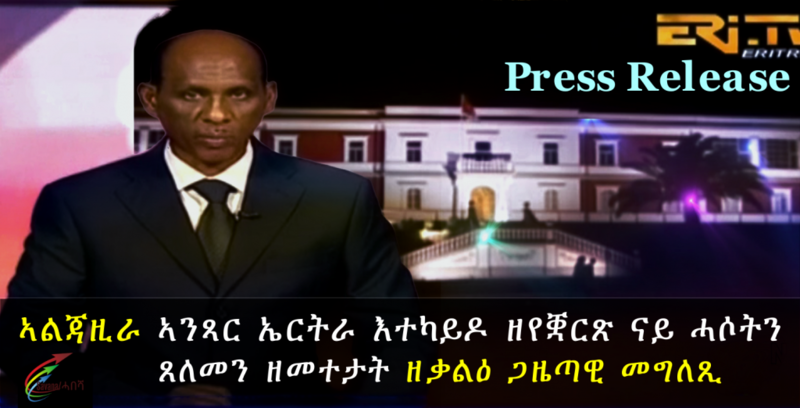 The Doha-based Al-Jezeera Tv Stations – both English and Arabic Channels – have been spewing false and vicious news about Eritrea this week. This is not, of course, the first time for these Channels to broadcast ludicrous allegations against Eritrea. In the current news broadcast, Al-Jeezera alleges that “Eritrea is holding Yemeni prisoners” at the “United Arab Emirates military base in Assab”. Al Jezeera does not provide any evidence or material proof to validate its outrageous claims. It shows satellite photos of some buildings in Assab but deliberately juxtaposes to them footage of detention centers and detainees in Yemen! This is outright and despicable dishonesty. Al Jezeera then interviews a certain Matt Bryden and another hired “academician” by the name of Andreas Krieg from King’s College in London. As it will be recalled, Matt Bryden was the first Chairman of the so-called Eritrea-Somalia Monitoring Group (SEMG) who was appointed by the UN in the immediate aftermath of the unwarranted sanctions against Eritrea. But he was booted out from the Monitoring Group after a few years when it was established that he was compromised and under the payroll of some countries. Mr. Kreig is a regular commentator for Al Jezeera, apparently hired to give “academic” mantle, to its selective defamation campaigns against its “adversaries” in the Gulf and elsewhere. Al Jeezera further claims that Eritrea has signed a “thirty-year agreement with the UAE for the leasing of a military base in Assab”. Again, this is absolutely false. The UAE has a temporary, operational, base related to the campaign against terrorism in the context of the war in Yemen; no more no less. The duration of this temporary facility is limited to the regionally sanctioned operations currently underway. Al Jezeera and certain countries that are behind the intermittent campaigns of disinformation against Eritrea are worried about the positive developments of peace and reconciliation in the region. The frantic defamation of Eritrea reflects their desperate attempts to sow confusion in a vain attempt to roll back the quest for enduring peace and cooperation in the Horn of Africa Region.